I'll wait and write a full review of Skyfall when I get to it in its proper order, mostly because I don't want to spoil anything or people who haven't seen it yet. So here's my quick review. Like all Daniel Craig Bond films, this movie takes a while to come together, but when it does, it comes together well. 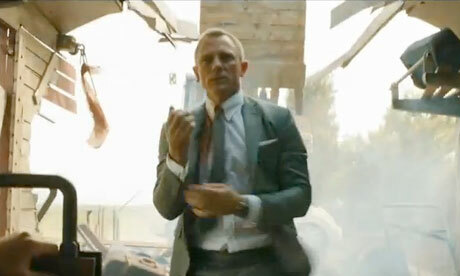 So if you liked Casino Royale (and/or like seeing Daniel Craig shirtless), you'll have a good time at Skyfall. The plot is also significantly easier to follow. So if you couldn't figure out what the hell was happening in Quantum of Solace, you don't need to worry. And if you felt the Daniel Craig years were lacking in some of the old familiar Bond tropes, they do a great job of satisfying nostalgic yearnings in a modernized way... or not modernized way as the case may be. One of the running themes of the movie is modern technology vs. "the old ways" that culminates in a stunning siege on the Scottish moors at the end of the film. The movie also delivers a lot of back-story on a lot of characters, which I always find a treat, especially where Bond is concerned. By the end, I was left with the feeling that the first three Craig-Bond films were something like a prequel trilogy (only a good one). The re-booted Bond's character arc catches up to where we first met the original Bond in Dr. No. I fully expect to see Sylvia Trench in the next film. And Javier Bardem rockets to near the top of the Best Bond Villain's list.